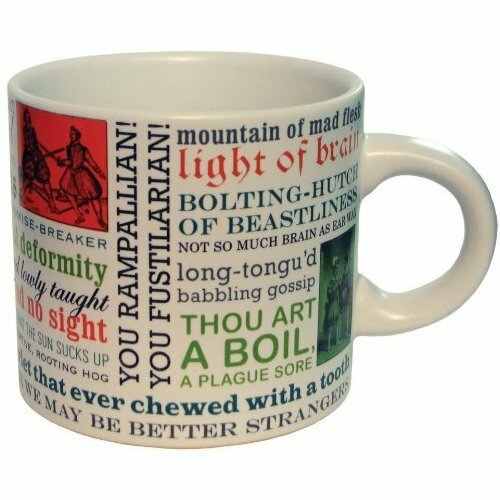 It doesn’t matter you answered that yes or no because you are definitely going to love this Shakespeare insults coffee mug. Why? That’s because this unique coffee mug has got 30 insults from the legend of literature, and yes all the insults are extremely funny and biting. Furthermore, this Shakespeare insults coffee mug is made of really awesome quality ceramic and that definitely makes it dishwasher and microwave safe. As mentioned earlier that it’s made of ceramic and has the following dimensions 4.6 x 4.6 x 3.8 inches. Some of you may feel that the mug is a bit heavy as it weighs slightly less than 1 pounds; adding to all this, this piece of beauty can hold up to 12 oz of any beverage of your choice. Is It a Good Gifting Idea? Definitely YES!! There’s no reason to think otherwise. It’s certainly an awesome gift (for giving and even for receiving) for a student, scholar and to anyone who loves humor. Price at just under $15 we believe that this is an absolute bargain. This is one of the coffee mugs that is bound to make you smile each and every day. You must have it in your coffee mugs collection. We simply love it and you’ll love it too!